Borovets is situated at 1350 m in the North hillsides of Rila – the highest mountain in Bulgaria. That guarantees a thick snow cover from December to April and great opportunities for all winter sports: from alpine skiing, snowboarding and freestyle to cross country skiing, biathlon, ski jumping and winter hiking. The total length of the slopes in Borovets is 58 km and the longest run is 12 km. The lift system includes 1 six-seat Gondola lift, 2 High Speed Quad Chair lifts, 1 Fixed Grip Quad Chair lift 10 Surface ski lifts and a several baby drag lifts. 19 ski runs can satisfy any skill level – beginners, intermediate or advanced skiers. 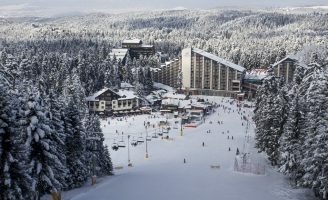 The ski area is divised in 3 zones: Central Borovets ski center – starting from 1337 m altitude up to 1780 m, Yastrebetz ski center – from 1340 m up to 2369 m and Markudjik ski center – from 2340 m up to 2550 m. The cross country trails are 35 km long, designed according to the erequirements of FIS (Federation Internationnale de Ski). The resort also offers biathlon facilities for training and competitions. Night skiing is also available every day from 5 pm to 10 pm. All ski trails and slopes are marked and groomed.